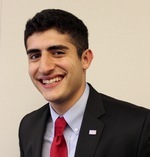 A native of Metro Detroit, Mark Haidar graduated from the University of Michigan’s Ford School of Public Policy in 2016. While in college, Mark interned for the Chicago Housing Authority, the White House Domestic Policy Council, and Google. He also spent a semester at the National University of Singapore, as well as participated in the Summer Venture in Management Program at Harvard Business School. After graduation, Mark worked as an Associate at Wellspring Consulting in New York, a strategy consulting firm that advises organizations in the social sector. Mark has now moved back home to Michigan and seeks to give back to the communities that shaped him to who he is today. He hopes to work for the Mayor’s office following the HIA Detroit Fellowship and to later attend law school, before ultimately engaging in a career of public service in the Metro Detroit area.